1. Take your net body measurements with underwear on. 4. Fill in all measurements relevant to the type of cloth you ordered. 5. You may leave blanks for irrelevant measurements, you are uncertain, or let our tailor to decide. Neck: Measure the girth immediate above the thyroid cartilage (the Adam's Apple). Please keep your head up and looking straight ahead. Make sure the tape is not too tight or too loose, is lying flat on the skin. Shoulder Width: Measure from the tip of your left shoulder (where you can feel a bony protrusion) to the tip of your right shoulder. 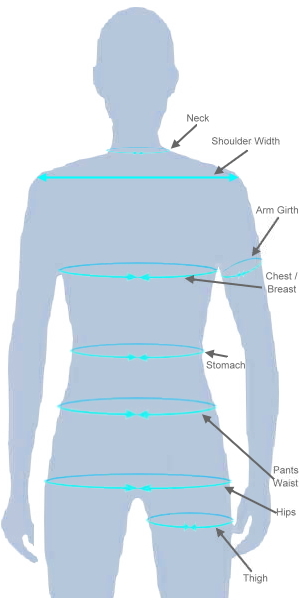 Chest/Breast: Measure around your chest/breast at its widest point. Ensure the measuring tape passes underneath your armpits and over your shoulder blades at the back. Stomach: Measure around your waist roughly at the level of your navel. This measurement may correspond to either the narrowest or the widest point of the waist, depending on build. Pants Waist: Measure all the way around your waistline, just higher than the waistband of the pants. Make sure the tape does not ride over the waistband. Measure to a comfortable tightness. Hips: Measure around your hips and buttocks at their widest point. Make sure you don't have anything in your pockets; otherwise you may get a measurement which is too large. Thigh: Measure at the fullest part of the thigh on one leg. Measure from the top of the waistband, along side of the body, to where you wish the bottom of the pants lie. This typically should be of a length that the pants leg rests on the shoe without touching the floor. Measure from the tip of the shoulder, along the dress sleeve down to where it ends. The sleeve should typically terminate at the base of the thumb, but this varies depending on taste. Measure a vertical line down from the base of your shirt collar at back to the lowest point of your desired clothing length. POSTURE (select the one nearest to your figure) HOW DO YOU LIKE YOUR CLOTH TO BE MADE?